Real Monstrosities: Schmidt Sting Pain Index: Categorising "OUCH"
I can only imagine him staring with gleeful anticipation as a wasp crawls all over his arm, its anger becoming increasingly evident. He resists the urge to shoo it away or run and instead watches keenly as the sting punctures his skin. He doesn't shout. He doesn't cry. He... ponders. Amidst the suffering, he reminisces on the pain of stings gone by. Then, after coming to his judgement, he writes a review. It was 1984 when he first shared his unique gift with the world. Not in a circus, but in a scientific paper called "Hemolytic activities of stinging insect venoms". Proud of his work, he would build on this initial paper for several years until the publication of "Hymenoptera venoms: striving toward the ultimate defense against vertebrates", wherein he samples the bittersweet delights of 78 species of ant, bee and wasp. The Schmidt Sting Pain Index places the amount of hurt on a scale from 0 to 4, where 0 is "finished? I didn't even realise you started" and 4 is "to be or not to be? With that said, let us begin! 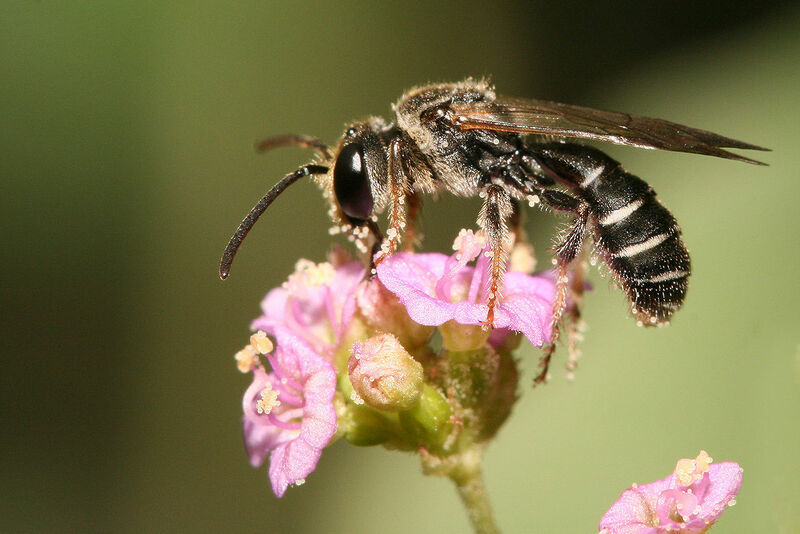 First up are the Sweat Bees. These are some 2,000 bees of the Halictidae family, reaching about 1 cm (0.4 in) at most and found all over the world. Some are solitary, others are eusocial, where they have a queen who lays the eggs and a load of workers who gather nectar from flowers and accidentally pollinate them in the process. They get their name from being attracted to human sweat. Have you ever sweated so much it got in your eyes and hurt just a little? That's salt and minerals, good eating for a Sweat Bee. Light, ephemeral, almost fruity. A tiny spark has singed a single hair on your arm. Doesn't that sound wonderful? A lot nicer than getting sweat in your eyes! I think Sweat Bee showers are the technology of the future. A bracing, all-natural cleansing to go with your Doctor Fish pedicure! Err.. is it natural? 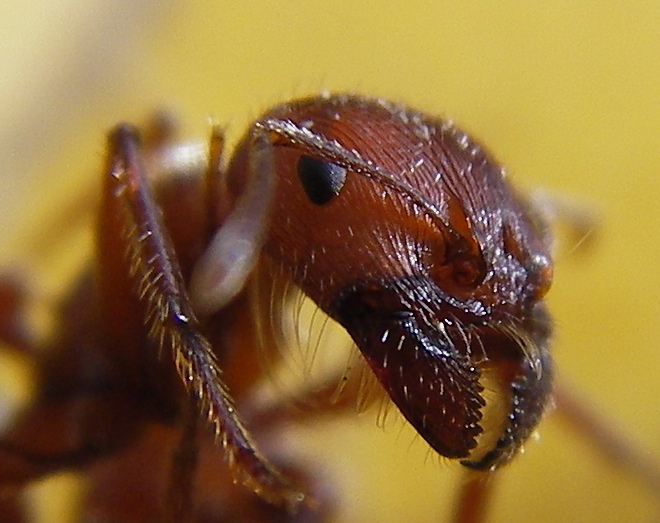 Fire Ants are going on 300 species in the genus Solenopsis. They're tiny, 5 mm (0.2 in) would be a big worker, many of the other's are half that. They make up for their puny size with sheer numbers, creating huge nests as they forage for seeds and young plants. Oh, and they sting. 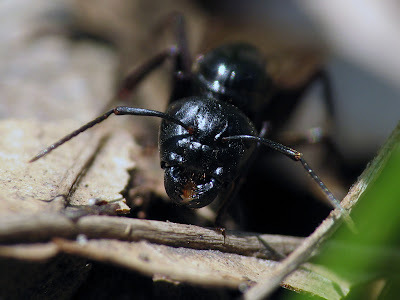 They bite down with their mandibles for a firm grip and then inject a little formic acid with a stinger. Sharp, sudden, mildly alarming. Like walking across a shag carpet and reaching for the light switch. Not so nice. As you would expect since they get the "Fire" part of their name from the way they feel. And the terrible thing is you probably won't get stung by just one. Queen Fire Ants can lay over a million eggs every year, so... try not to stumble into one of their nests. This species of Central American ant is named after its deeply fascinating relationship with the Bullhorn Acacia tree. 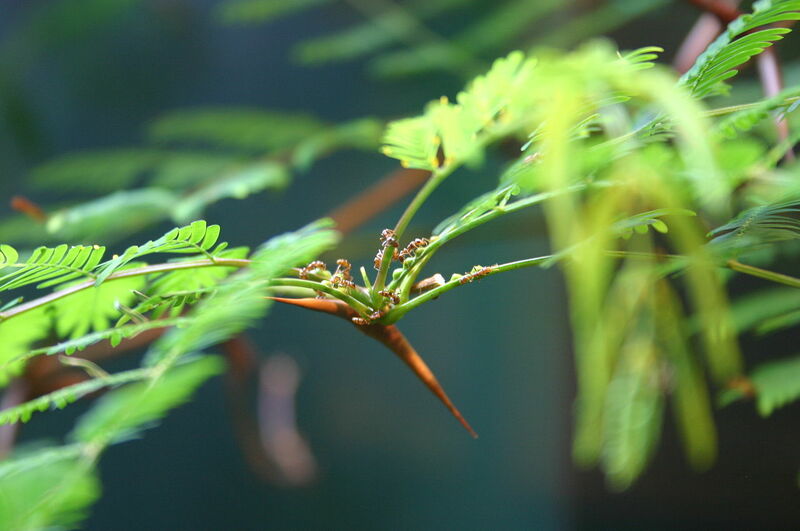 The Bullhorn Acacia is itself named after the large, hollow thorns found at the base of the leaves. The tiny ants nibble a small hole and live right inside the "bullhorns", alongside their eggs and larvae. The Bullhorn Acacia also has small nodules on the stem that secrete nectar for the adult ants and protein-rich pods called Beltian bodies that the ants pluck off and take to the thorn-nest for the larvae to eat. In other words, the tree provides the ants with absolutely everything they need to survive! A rare, piercing, elevated sort of pain. Someone has fired a staple into your cheek. The Bullhorn Acacia Ant is only too happy to bite and sting in defence of its living home. Most other Acacias have alkaloids in the leaves to keep caterpillars and the like from eating them, the Bullhorn outsources this task to the ants and richly compensates them for it. Named I suppose from being black and white rather than black and yellow, this is a species of wasp that builds a paper nest made of chewed up wood. The adults mainly eat sweets; nectar, tree sap, fruit pulp... energy drinks, really. As with the Bullhorn Acacia Ants the larvae need protein to grow, so they get fed chewed up insects. The weird thing is that the larvae feed the adults sugary goodness in return. Eventually there's just too many adults so they go off and bother our picnics. Chomping through wood and insects alike, it's clear they're not bad with their mandibles! Rich, hearty, slightly crunchy. Similar to getting your hand mashed in a revolving door. Not bad with their sting either. And the awful thing is that they're really keen to use it. Over and over and over again. A whole nest of them. Over and over. 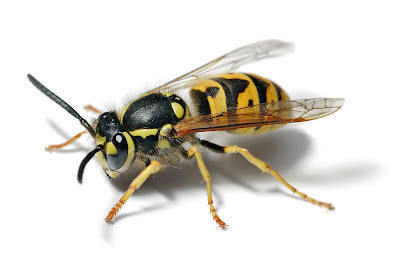 This is the American name for an assortment of wasps in the genera Vespula and Dolichovespula. They're found across the northern hemisphere and include all the familiar European wasps as well as the Bald-faced Hornet, which isn't really a hornet. And so, they usually reach a bit more than 1 cm (0.4 in) long and create paper nests out of chewed up wood fibres. Most Vespula nest in closed, safely concealed areas or underground, while Dolichovespula hang their nests from a tree branch. They only last a year, with mated queens hibernating to start a new colony the following spring. She'll lay hundreds of eggs every day so that a big colony could have 5,000 workers! 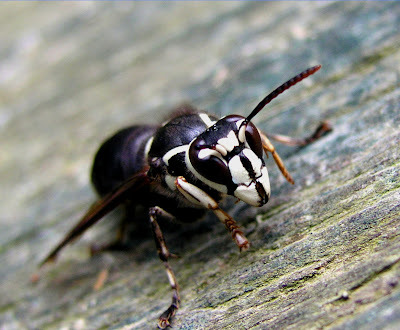 Since the Bald-faced Hornet is really an atypical Yellowjacket, the food situation is exactly the same. Meaty munchies to feed the growing brood who provide sugar refreshment in return, and then thousands of thirsty wasps all over your orange juice when there aren't enough larvae left. Another similarity is the angry, aggressive, repeated stings if you get too close to their nest. Hot and smoky, almost irreverent. Imagine W. C. Fields extinguishing a cigar on your tongue. W. C. Fields! Not William Claude Dukenfield (January 29, 1880 – December 25, 1946)... known for his comic persona as a misanthropic and hard-drinking egotist who remained a sympathetic character despite his snarling contempt for dogs, children and women? I knew he'd find an interesting and funny way of extinguishing his cigar! It's the good ol' Honey Bee! These are 7 species of southeast Asian bee in the genus Apis. I guess they're not all that southeast Asian any more, these day they're citizens of the world. As you probably know, they aren't named after what their sting feels like. They are the world's foremost honey producers. There are actually some other bees who produce honey, but Apis is the real deal. These guys can create ginormous hives containing as many as 60,000 workers. 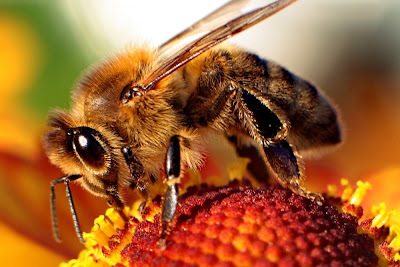 The hive itself is made of beeswax, which the bees secrete from wax glands. Another secretion is royal jelly, protein-rich stuff that honey bees produce when they're young adults. Larvae are fed this stuff for a few days before they graduate to protein from pollen and sugar from honey and nectar. Unless a new queen is wanted, that is. In that case the larvae are bathed in enough royal jelly to swim in and left to develop ovaries and a mean waving hand. The honey is a food store for rainy days and cold weather, which they create by repeatedly eating and regurgitating nectar. Basically it's vomit, aged to perfection. It's pretty weird that they eat it. Even weirder that we eat it. They are, therefore, extremely protective of their honey and the nest in general. Honey Bees have a finely barbed sting which seems to work perfectly fine against other insects, but there's a snag when it comes to mammals. Literally! Our skin is so thick and springy, that the sting gets stuck. Tearing itself free, the Honey Bee leaves behind a sting and venom sac, complete with all the muscles and nerves required to keep pumping in the venom while the rest of the bee goes off to die a hero's death. Now we get to a REAL hornet! 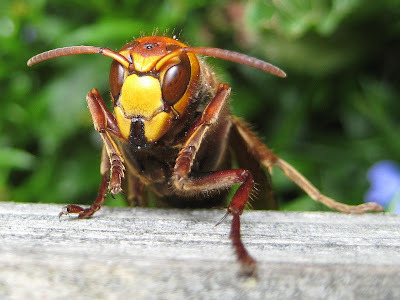 The European Hornet is a true hornet, in that it belongs to the genus Vespa. They are close relatives of the Yellowjackets, together forming almost the entirety of the subfamily Vespinae. The European Hornet is found from Britain to Japan and has been introduced to North America, too. They don't get much further south than North Africa, though. They are the biggest social wasps in Europe, the workers reaching 3.5 cm (1.4 in) long. This is one of the things about hornets, they're bigger than most other social wasps. They also have a proportionally wider head than Yellowjackets. In common with their close relatives is the large paper nests they create. The difference is their nests tend to be much bigger, yet only house a few hundred individuals. Again, larvae are fed mashed up insects while adults look for a sugar rush until cold weather overtakes them all and mated queens hibernate to start a new colony in spring. Like a matchhead that flips off and burns on your skin. Oh yeh, another difference between Hornets and Yellowjackets. Hornets are actually quite docile! They may be bigger, but they are far less aggressive. This is good. I once came across a load of wasps popping in and out of a tree hollow in Austria. I got quite close and they seemed cool with it. I guess they were hornets! These ladies from southwest United States are like even worse Fire Ants. Red Harvesters are bigger, workers reaching up to 8 mm (0.3 in) long. They have powerful mandibles, presumably for cracking open the seeds they feed on. They actually leave something of a miniature path of destruction, scavenging all the seeds in the vicinity such that the land around their nest is totally barren aside from various stones and seed cases strewn around like an aftermath. The other thing is their terrible sting. Bold and unrelenting. Somebody is using a drill to excavate your ingrown toenail. Harvesters have some of the most potent venom recorded among insects. And they seem to have an active desire to try it out. Avoid! Yet more wasps! Social ones, too. This time specifically named after the fact that they build paper nests. The Hornets and Yellowjackets we saw before were both in the subfamily Vespinae, which is in the family Vespidae. Paper Wasps also vespids, but they are another entire subfamily called Polistinae, containing about 1,100 species. 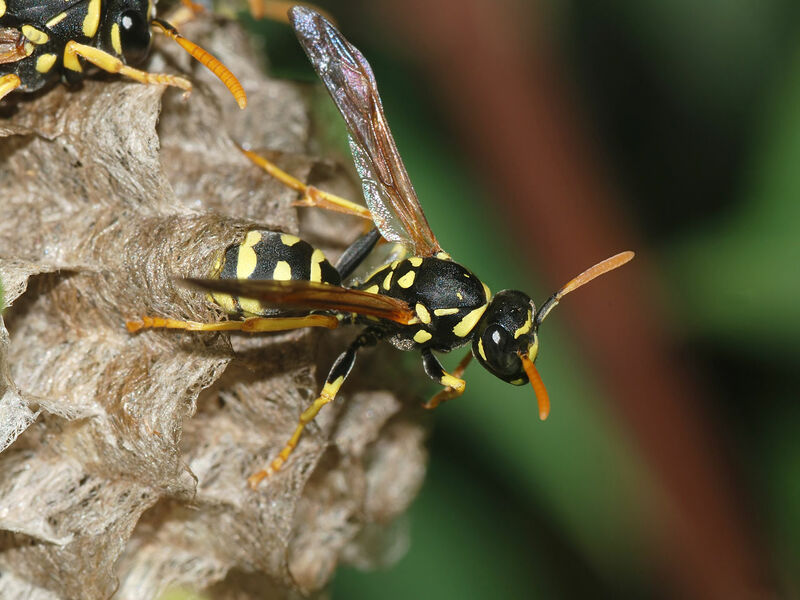 Many Paper Wasps create rather small, open nests that are really just a single comb on a stalk. Caustic and burning. Distinctly bitter aftertaste. Like spilling a beaker of hydrochloric acid on a paper cut. Hydrochloric acid AND a paper cut! One or the other sure... but both? Oh dear. Things have turned to the dark side as we reach the apex of pain. Appropriate, I guess. Except it ain't necessarily so. Tarantula Hawks are nectar drinkers who flutter from flower to flower in the warm summer months. Look at it. Is this not the very face of spring? 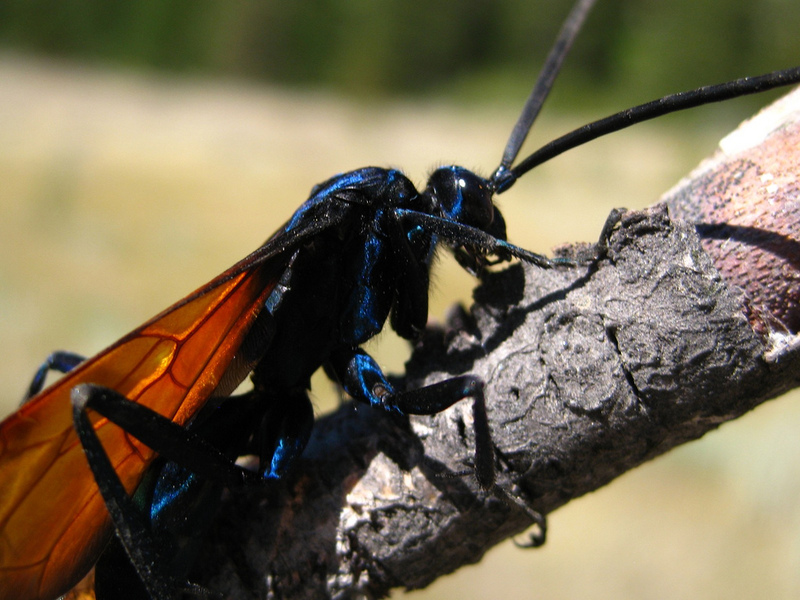 There are several hundred species of Tarantula Hawk in the genera Pepsis and Hemipepsis. They are found all over the tropics and subtropics, many of them reaching about 5 cm (2 in) long and looking something like a butterfly that got taken over by a Symbiote. Still, they have their own brand of... not "prettiness", exactly. But with that black, metallic blue body and rust coloured wings, I think they're kinda gorgeous. The problem, as we have seen, is that the larvae probably won't live on nectar. They need protein to help them grow. Not to worry, mother will use her 7 mm (0.3 in) sting to paralyse a massive spider. Then she'll drag it to an underground burrow and lay a single egg. When the larvae hatches, it digs into spider flesh and dines. The spider is paralysed but alive, so keeping the most vital organs to last keeps it fresh for as long as possible. I'm glad we got fridges for that. Blinding, fierce, shockingly electric. A running hair drier has been dropped into your bubble bath. Yikes! The small mercy is that this pain only last for a few minutes. Did you see that, though? Large Tarantula Hawks can have a sting that's longer than a Fire Ant! Eep. It's off the scale! It's sky high! It's turned to 11! It's... it's... quite painful, actually. The Bullet Ant is a single species that lives in Central America and the Amazon, in nests of a few hundred individuals. 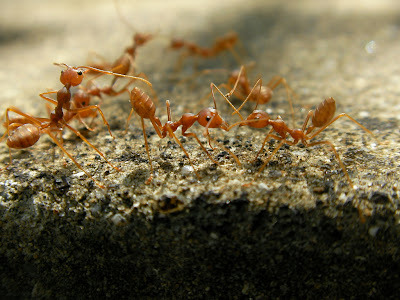 Workers are 2 or 3 cm (0.8 to 1.2 in) long! So at least they look just like the kind of ant one ought to be wary of. These ladies are predators, taking down all sorts of insects and such from around the nest or up their local tree. They're not at all adverse to dessert though, and are often seen carrying back mouthfuls of nectar, too. They get their name from just how remarkably painful their sting is. Some locals also call it something that translates to "24 Hour Ant", because the incredible pain lasts for several hours and lingers on for several more. Some locals take a completely different tack to this whole "getting stung" thing than our crazy hero, Schmidt. And I don't mean my way, which is to avoid it. They don't go broad and get stung by lots of different things. They go deep, and get stung by one thing a LOT. It's good ol' initiation rites! And it's enough to turn a great, big, burly muscle man into a sobbing child. Pure, intense, brilliant pain. Like fire-walking over flaming charcoal with a 3-inch rusty nail grinding into your heel. The pain is incredible and long-lasting. The initiation thing is all about getting your hands stung by loads and loads of Bullet Ants, and it can lead to temporary paralysis of part of the arms and days of uncontrollable shaking. Better you than me, mate! And there we have it. What a journey! From Sweat Bee showers to "I don't want to have hands any more". Sort of like a (slightly) less stupid Jackass that wants to give back to society. But... is there a sting in the tail? Of course! Where would the Schmidt Sting Pain Index be without a sting? Lamentably enough, Schmidt didn't really collect lots of stinging insects and systematically go through them all, he just gets stung a lot because he's a scientist who researches insects who sting. It's far from a controlled investigation into pain. He's been stung by some insects lots of times, others have only stung him a once or twice. As is always the case with venom, a lot of it depends on where you get stung or bitten and just how much venom gets in. And pain is quite subjective, not only among people but even in the same person at different times, as you can see with the 0 - 2.0 of the Honey Bee. Sometimes pain just doesn't feel so bad when you have other things to concentrate on. Not with the Bullet Ant though. That always hurts. In any case, I should point out that this is all Hymenoptera; ants bees and wasps. 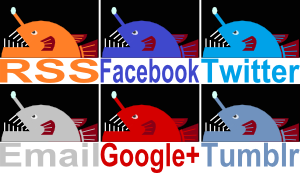 The guide to centipedes and scorpions is yet to be written. So if you happen find pain an intellectually fulfilling experience, there's plenty more to go round. Just make sure to do your research first so you don't die. And do it in a safe, comfortable place with a trusted friend. And drink lots of water. crazy man! love those pain descriptions, though! wine critic / pain ranker. The man's a nutter! But eloquent with it. Nor I. Not too keen on the Paper Wasp, either! I fully endorse describing pain as if it were wine. Yes! Turns out it works really well. Only you could describe venom with such wit and hilarity. Me and Justin O. Schmidt, darling! Yup, it's definitely up there!